Objective: To examine the association between hypertensive diseases of pregnancy (gestational hypertension and pre-eclampsia) and the development of circulatory diseases in later life. Design: Cohort study of women who had pre-eclampsia during their first singleton pregnancy. Two comparison groups were matched for age and year of delivery, one with gestational hypertension and one with no history of raised blood pressure. Setting: Maternity services in the Grampian region of Scotland. Participants: Women selected from the Aberdeen maternity and neonatal databank who were resident in Aberdeen and who delivered a first, live singleton from 1951 to 1970. Main outcome measures: Current vital and cardiovascular health status ascertained through postal questionnaire survey, clinical examination, linkage to hospital discharge, and mortality data. Results: There were significant positive associations between pre-eclampsia/eclampsia or gestational hypertension and later hypertension in all measures. The adjusted relative risks varied from 1.13-3.72 for gestational hypertension and 1.40-3.98 for pre-eclampsia or eclampsia. The adjusted incident rate ratio for death from stroke for the pre-eclampsia/eclampsia group was 3.59 (95% confidence interval 1.04 to 12.4). Conclusions: Hypertensive diseases of pregnancy seem to be associated in later life with diseases related to hypertension. If greater awareness of this association leads to earlier diagnosis and improved management, there may be scope for reducing a proportion of the morbidity and mortality from such diseases. Despite their frequent occurrence, relatively little research has been conducted into the long term effects of hypertensive problems in pregnancy. Both gestational hypertension and pre-eclampsia or eclampsia may be associated in later life with raised blood pressure7–11 or hypertension12–15 and cardiovascular disease. 16 17 Many of the reported studies have examined only hypertension as an outcome and have been limited by small sample sizes, 7 9–13 15 inappropriate comparison groups, 8 12 15 18 or relatively short follow up. 7 8 There is also evidence to suggest that self reported exposure is more prone to recall bias with increasing time.19–21 As information on pregnancy related exposures is often sought more than 10 years later 20 22 recall bias is of particular concern. We designed a retrospective cohort study using the Aberdeen maternity and neonatal databank, a computerised database which has collated validated data on all obstetric events in women attending the Aberdeen maternity hospital since 1951.23 The hospital and associated units provide obstetric care for a population of about 400 000 people. The databank used standardised diagnostic criteria during the study and linkage to the individual original obstetric case notes. We determined whether a recorded history of gestational hypertension or pre-eclampsia or eclampsia predicted cardiovascular disease in later life, as indicated by measures of mortality and morbidity. From the databank we identified a cohort of women who were living in Aberdeen city at the time of delivery. The cohort comprised all women who had a diagnosis of pre-eclampsia or eclampsia during their first singleton pregnancy in the years 1951 to 1970; an individually matched sample of women with a diagnosis of gestational hypertension during their first singleton pregnancy and matched for age to the nearest year and year of delivery with the previous group; and an individually matched sample of women with no history of raised blood pressure during their first singleton pregnancy likewise matched with the first group. Gestational hypertension was defined as diastolic pressure ≥90 mm Hg on two occasions at least four hours apart or a single reading of ≥110 mm Hg from 20 weeks' gestation onwards in a previously normotensive woman. Pre-eclampsia was defined as gestational hypertension plus proteinuria of ≥0.3 g/24 hours. Eclampsia was defined clinically as convulsions occurring in the presence of pre-eclampsia. Women with chronic hypertension were separately categorised on the databank and excluded from this study. No other exclusion criteria were applied. We carried out two tracing exercises for the cohort. The first, carried out in 1996, was at the local level using the Grampian community health index (a comprehensive regional primary care register24) to identify the current name and address of all cohort members still alive and resident in the Grampian area. From this exercise we were able us to contact the current general practitioners of women in the original cohort who were still living in the area. The second tracing exercise was at national level and was undertaken in 1999. The information and statistics division (ISD) of the NHS in Scotland, Edinburgh, used probability matching to identify any women from the cohort who were admitted to hospital from 1980 to 1999. In collaboration with the NHS central registry in Southport, the division also ascertained the vital status of women in the cohort and obtained death certificates for any who had died, including those who died in the United Kingdom but outside Scotland. We retrieved the original databank records of women who could not be traced through either exercise to check whether additional information was available to maximise tracing rates. Questionnaire and clinical examination—We contacted the general practitioner of each woman still living in Grampian and sought consent for us to contact her. We sent those for whom consent was given a self completion questionnaire, with questions covering general health, lifestyle and wellbeing, and obstetric history, including illnesses related to pregnancy. The questions were taken from previously validated questionnaires. The study hypothesis was not disclosed to prevent bias in reporting current health status. Non-respondents received two reminder questionnaires together with reply paid envelopes. The questionnaire included an invitation to contribute further by attending for a medical examination. Each medical examination was conducted by one of two trained research nurses in accordance with an examination protocol developed for the project. The nurses were blind to study group status of the women they were examining, and appointments were scheduled in a random manner so that no batching of groups occurred, which would undermine blinding. All women had blood pressure measured twice with a random zero sphygmomanometer with the appropriate cuff size in the seated position after a period of rest, and the mean of the two readings was taken. Height and weight were measured and an electrocardiogram produced. Hospital discharges—In collaboration with the information and statistics division (ISD) of the NHS in Scotland we conducted a data linkage exercise25 to obtain details of all hospital discharges in cohort members. The division holds data on hospital discharges and cancer registrations of individuals who have been resident in Scotland at any point. Probability matching was based on first name, surname, previous surname, and date of birth, and any obvious mismatches were checked manually by the division. Deaths—We obtained details of the dates and causes of death from the UK NHS central register. The expected frequency of outcome measures varies for different cardiovascular conditions in women in Scotland, from 0.5% for electrocardiographic evidence of myocardial infarction to over 8% for angina defined by Rose questionnaire criteria.3 The frequency of hypertension varies depending on the definition used. One study of women aged 40-59 years in Scotland identified 7% with a diastolic pressure greater than 100 mm Hg.26 For an outcome present in 5% of the control group, a sample size of 932 subjects per group would detect a doubling of risk, with 80% power at the 5% level of significance. On this basis, we included all women with pre-eclampsia or eclampsia (likely to be the group with fewest potential members) in the cohort and randomly sampled control and gestational hypertension groups (matched for age and year of delivery) of the same size as this group. We used χ2 and t tests as appropriate to test for baseline differences between the three groups, and, for all analyses, we used the control group as reference for comparisons with each of the two “exposed” groups (gestational hypertension and pre-eclampsia or eclampsia). For the questionnaire and clinical examination data, we computed odds ratios and used logistic regression methods to adjust for the influences of age, body mass index, and smoking behaviour at follow up. For the mortality and hospital discharge outcomes, we constructed diagnosis groups using international classification of diseases (ninth/tenth edition) codes: “hypertension” (401-4/I10-14); “ischaemic heart disease” (410-4, 428/I20-25, I50); “cerebrovascular disease” (430-8/I60-9); “kidney disease” (580-99/N00-39); “other circulatory disease” (390-8, 405, 415-27, 440-59/ I00-9, I15, I26-8, I30-49, I51-2, I70-99). We counted only first admissions in a diagnosis group, using the date of first admission as the incident date, but women could appear in more than one diagnosis group. We computed incident rate ratios for deaths and hospital discharges and used logistic regression to adjust for potential confounders. Social class (UK registrar general) at time of follow up was used for analyses of questionnaire and clinical examination outcomes. This was allocated on the basis of the woman's own social class, unless this fell outside classes I-V, in which case the spouse or partner's social class was used if available. Social class at the time of the index pregnancy, based on the occupation of the spouse or head of household, was used for analyses of hospital admissions and deaths. The total cohort comprised 3593. Table 1 summarises the baseline characteristics of the three groups. The similarity of the mean ages at delivery reflects the initial age matching. Compared with the control group, women in the gestational hypertension and pre-eclampsia or eclampsia groups were less likely to be in occupational classes I-III non-manual (professional/administrative) but more likely to have booked for antenatal care before 20 weeks' gestation. They were also less likely to ever have been smokers (although smoking data at the time of pregnancy were incomplete), and there were small significant differences between the groups in mean body mass index. Local tracing identified 1963 women (54.6%) who were still alive and resident in Grampian (figure). General practitioners gave consent for a questionnaire to be sent to 1876 (95.6%) of these women. The information and statistics division ascertained the current vital status of 2790 (77.7%) of the original cohort, of whom 265 (9.5%) were known to have died. Linkage with hospital discharge data identified 1829 (65.6%) women of the original cohort who had been admitted at least once to a Scottish hospital between 1980 and 1999. Compared with these untraced women, on average the traced women were a year older at delivery, the mean body mass index at the time of the index pregnancy was 0.6 kg/m2 higher, and fewer were from non-manual social classes (31% (778/2481) v 39% (267/680)). The success of the tracing differed across the three comparison groups (figure). Of the 1876 questionnaires, 1312 (71%) were returned with usable responses. Forty one were incorrectly identified as being eligible for the study by the Aberdeen neonatal and maternity databank. Table 2 summarises the self reported demographic and health characteristics of the questionnaire respondents at follow up. Respondents were more likely to be in manual social classes at baseline than the starting cohort. Respondents in gestational hypertension and pre-eclampsia or eclampsia groups had higher mean body mass index at follow up and were less likely to be former or current smokers, as they were at baseline. There were no clinically significant differences in alcohol intake, regular exercise, or use of exogenous hormones across the groups. A much higher proportion of the women were of non-manual social classes at follow up, using the woman's own profession, than at baseline using husband/partner's profession. There was no gradient in social class at follow up across the groups using this measure. After adjustment for known risk factors for hypertension, women in both the gestational hypertension and pre-eclampsia or eclampsia groups had higher odds ratios for indicators of hypertension (table 3). This was not seen for the other conditions of interest, except for kidney disease in the pre-eclampsia or eclampsia group, which may have related to the original episode in pregnancy. 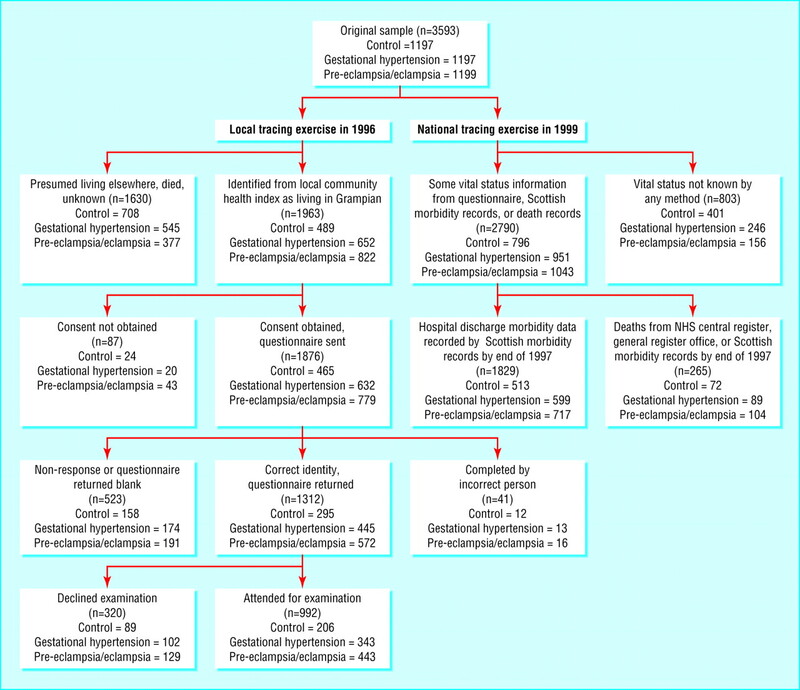 Similar results were observed in the clinical examination data (table 4), with increased risk of hypertension defined by WHO criteria in both gestational hypertension and pre-eclampsia or eclampsia groups. In total, 41.1% of the former and 48.8% of the latter provisionally fulfilled the WHO criteria for hypertension compared with 26.7% in the control group. Women in the gestational hypertension group were more likely to have been admitted to hospital for cerebrovascular disease, ischaemic heart disease, hypertension, and “other” circulatory disease, although this reached significance only for hypertension and other circulatory disease (table 5). Women in the pre-eclampsia or eclampsia group were also more likely to be admitted for hypertension, cerebrovascular disease, and other circulatory disease. Over 90% of the traced cohort were alive at the time of analysis, and there were 265 deaths available for analysis (table 6). By the time of follow up, there were 72 deaths in the control group, 89 in the gestational hypertension group, and 104 in the pre-eclampsia or eclampsia group. No deaths were coded to hypertension per se. After adjustment, mortality for all causes, stroke, and ischaemic heart disease was higher in both the gestational hypertension and pre-eclampsia or eclampsia groups. The pattern was consistent, though only the increased risk of stroke in the pre-eclampsia or eclampsia group was significant. Women with a history of gestational hypertension or of pre-eclampsia or eclampsia are at increased risk of hypertensive and associated diseases in later life. Our findings are consistent with those of previous work.7–15 We found an increased risk of admission to hospital for stroke and mortality from stroke but no significant increased risk of morbidity and mortality from coronary heart disease as has previously been reported. 16 17 This may be because we used a study design that did not depend on recall and used standardised criteria to distinguish gestational hypertension and pre-eclampsia from chronic pre-existing hypertension. This is of importance in counselling women about their future health risks after delivery and in designing healthcare interventions to minimise avoidable morbidity and mortality. Our design minimised the information bias that may occur with retrospective studies and quantified the absolute risk of adverse outcomes. It has two key advantages over many other investigations into the associations of interest: the underlying cohort design and the use of different data sources to ascertain the outcomes of interest, which permitted assessment of the consistency of the findings. Social class differed between the three study groups in the original cohort. This might be a result of chance or might indicate an association between social class and hypertensive diseases in pregnancy. Though such associations have been reported, 27 28 there is no clear social class gradient. Pre-eclampsia or eclampsia is less common in smokers than in non-smokers 27 28 and currently smoking is associated with social class, though in 1961 UK survey data showed little social class gradient in smoking in women.29 We found a modest gradient in smoking across social class at the time of pregnancy but smoking information was recorded for only 28%. If there is a true inverse association between pre-eclampsia or eclampsia and smoking, and if recorded smoking habit during first pregnancy is an indicator of likely smoking habit in later life, then the pre-eclampsia or eclampsia group should in theory be at a lower than average risk of smoking related disease in later life. If so, this would operate against the hypothesis and might suggest that our results underestimate the association between pre-eclampsia or eclampsia and circulatory diseases. The tracing rates varied across the three groups. Those who were normotensive during their first full term pregnancy were least likely to still be living in Grampian at follow up, suggesting selective migration from the area by the control groups. The national tracing exercise, however, was more successful and provided vital status and hospital discharge data for a larger proportion of women in each comparison group. Broadly similar patterns of cardiovascular sequelae were observed in the different groups, irrespective of whether the outcome measure used was obtained through the local or national tracing. Another important potential bias could have occurred if there were important differences in the response rates of those traced locally. There were in fact only small differences in the response rates to the survey by the three comparison groups (70%, 77%, and 77%) as shown in table 2, suggesting that response bias is unlikely to have materially affected our results. There were more women from higher social classes in the control group (table 1). Such women were more likely to emigrate from Grampian, resulting in a lower response rate in the control group. There was consistency of the findings across the different methods of ascertaining outcomes. The association between gestational hypertensive disease and hypertension in later life was seen in the questionnaire and clinical examination data and also in the hospital diagnosis data and the mortality data. We suggest that our observations cannot be explained by chance or bias. The findings have implications for the aetiology and pathogenesis of circulatory disease, both in pregnancy and in later life. They also suggest that interventions that might minimise the risk of such conditions in later life should be identified and evaluated. We acknowledge the contribution of Dean Phillips for tracing and data management; Amanda Cardy for review of the original case notes; Nicola Torrance for assistance with the data collection and the operation of clinics; Linda Harrigan and Wendy Aiken for entering the data; Tracy Mapp for assistance with the study design; Isobel Ford and Ian Ross at Department of Clinical Biochemistry, Aberdeen, for assistance with the laboratory analysis; Val Angus of practitioner services at Grampian Health Board for tracing women; information and statistics division for record linkage; and the staff of the MONICA project at Queens University Belfast for assistance with Minnesota coding of ECGs. Contributors: MSW, DMC, BJW, PH, and WCSS conceived the study and contributed to the analysis and interpretation. MSW also managed the implementation of the study. GJP did the statistical analysis and contributed to the interpretation of the findings. SS contributed to the development of the clinical measurement procedures and was responsible for the clinical examinations. The report was written with contributions from all authors. WCSS is the guarantor. Funding British Heart Foundation, grant number PG/95130. The guarantor accepts full responsibility for the conduct of the study, had access to the data, and controlled the decision to publish. Ethical approval The study protocol was approved by the Joint Grampian Health Board and University of Aberdeen ethics committee, the information and statistics division privacy advisory committee and the Grampian Health Board general practice subcommittee.
. Myocardial infarction and coronary deaths in the World Health Organisation MONICA project: registration procedures, event rates, and case fatality rates in 38 populations from 21 countries in four continents. Circulation 1994; 90: 583–612.
. Prevalence of coronary heart disease in Scotland: Scottish heart health study. Br Heart J 1990; 64: 295–298.
. Long-term effects of childbearing on health. J Epidemiol Community Health 1985; 39: 343–346.
. Report on high blood pressure in pregnancy. www.nhlbi.nih.gov/health/prof/heart/hbp/hbp_preg.pdf (accessed 6 Feb 2003). .Hypertension in pregnancy. In: Bulpitt CJ, ed. Handbook of hypertension., Vol 20. Epidemiology of hypertension New York, NY: Elsevier Science, 2000.
. Blood pressure of young mothers and their children after hypertension in adolescent pregnancy: six to nine year follow-up. Am J Epidemiol 1982; 115: 861–867.
. Incidence of hypertension after pregnancy toxaemia. BMJ 1959; 2: 159–162.
. Long-term effect of pre-eclampsia on blood pressure. Lancet 1961; 2: 1373–1375.
. A study of the long-term effects of pre-eclampsia on blood pressure and renal function. J Obstet Gynaecol 1974; 81: 903–906.
. Remote prognosis of pre-eclampsia in women 25 years old and younger. Am J Obstet Gynecol 1988; 159: 156–160.
. Prediction of later hypertension following a hypertensive pregnancy. J Hypertension 1983; 1(suppl 2): 94–96.
. Prospective controlled five-year follow up study of primiparas with gestational hypertension. Acta Obstet Gynecol Scand 1998; 67: 605–609.
. Severe pre-eclampsia-eclampsia in young primigravid women: subsequent pregnancy outcome and remote prognosis. Am J Obstet Gynecol 1986; 155: 1011–1016.
. Long-term follow-up of women with hypertension in pregnancy. Int J Gynaecol Obstet 1988; 27: 45–49.
. Cardiovascular sequelae of toxaemia of pregnancy. Heart 1997; 77: 154–158.
. Pregnancy complications and maternal risk of ischaemic heart disease: a retrospective cohort study of 129,290 births. Lancet 2001; 357: 2002–2006.
. Pregnancy outcome after eclampsia and long-term prognosis. Am J Obstet Gynecol 1992; 166: 1757–1763.
. Differential recall as a source of bias in epidemiologic research. J Clin Epidemiol 1990; 43: 1337–1341.
. How well they remember: the accuracy of patient reports. Arch Pediatr Adolesc Med 1995; 149: 553–558. , See LC. Agreement between maternal interview- and medical record-based gestational age. Am J Epidemiol 1992; 136: 566–573.
. Maternal recall of distant pregnancy events. J Clin Epidemiol 1998; 51: 399–405.
. The Aberdeen maternity and neonatal data bank. In: Mednick SA, Baert AE, eds. Prospective longitudinal research. Oxford: Oxford University Press, 1981.
. The public health uses of the Scottish community health index (CHI). J Public Health Med 1996; 18: 465–472.
. The Scottish record linkage system. Health Bull 1993; 51: 72–79.
. Concomitants of excess coronary deaths major risk factor and lifestyle findings from 10,359 men and women in the Scottish heart health study. Scot Med J 1989; 34: 550–555.
. Smoking and pre-eclampsia. In: Poswillo D, Alberman E, eds. Effects of smoking on the fetus, neonate and child. Oxford: Oxford University Press, 1992:81–88.
. Long term mortality of mothers and fathers after pre-eclampsia: population based cohort study. BMJ 2001; 323: 1213–1216.